It's going to be another big weekend for Malayalam films with four new movies all set to hit the screens. Hindi film Barfi! and the Telugu remake Cheetah will also release at the same time. Here is a look at the four new releases in Malayalam. "It is not often that you will find a film in any Indian language with a middle-aged woman playing the lead. And the most important thing is that this story is not about her husband, children, family or anyone else but it is about her. 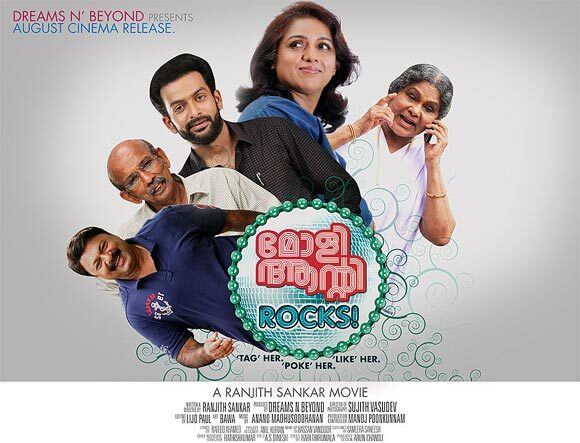 That attracted me to the script," says an excited Revathy about Ranjith Sankar's Molly Aunty Rocks. Ranjith shot to fame with Passenger and Arjunan Sakshi. The film is about a bank clerk named Molly (Revathy), whose husband and daughters are settled in the US. She rejoins the bank after several years of leave in the hope of taking voluntary retirement and going back to the US. But that is when she has a showdown with an egoistic IRS officer named Pranav Roy (Prithviraj). K S Sethumadhavan's Chattakkari and the Hindi version Julie became a sensation in the 1970s. Now his son Santhosh Sethumadhavan is ready with the remake. Based on a novel by Pamman, Chattakkari is about the romantic story of an Anglo Indian girl and a Hindu boy. Lakshmi was in the lead role decades ago and Shamna Kasim (Poorna) is doing the same role in the new version. The cast includes Hemanth, Harikrishnan, Innocent and Suvarna Mathew. The songs composed by M Jayachandran have already become a sensation. Ithra Maathram is based on a novel of the same name by Kalpatta Narayanan. The film is directed by critic and writer, K Gopinathan. The death of a housewife named Sumithra (Swetha Menon), deeply affects her husband Vasudevan (Biju Menon) and daughter Anasooya (Malavika). The story unfolds in a village in Wynad. Based on a story by the famous writer Sethu, debutant director Joe Chalissery's Bhoopadathil Illatha Oridam has Sreenivasan playing the lead. Nivin Pauly, who is riding high after the success of Thattathin Marayathu, has done a brief role in the film. Rajasri, Iniya and Suraj Venjarammoodu are also in the film.